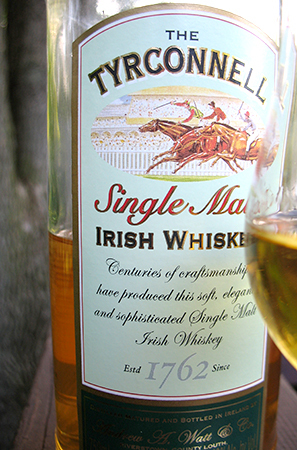 Tyrconnell is an Irish single malt whiskey. I am not sure if there was ever a distillery of that name; the current Tyrconnell is a brand owned by the Cooley distillery. I am not sure if it is triple or double-distilled but I believe Tyrconnell is made with entirely unpeated malt (at any rate I am pretty sure this one is unpeated). I don’t know very much more about Irish whiskey as a whole than I do about Tyrconnell. I’ve had a couple of recent releases from Redbreast, and the occasional Bushmill’s and Jameson’s but have never been very moved to try and educate myself further. I put this down to the fact that my friends in graduate school who were most likely to drink Irish whiskies at bars were also very likely to enjoy stepdancing and/or the music of Enya. In short, my ignorance is entirely justified. I came across this particular whiskey at our local pub some weeks ago, and quite liked it. As it is both very affordable and locally available I decided to get a bottle and pour from it at our local whisky group’s recent monthly tasting for June. I was expecting it to be a crowd-pleaser with its fruit-forward profile. Much to my surprise, while 2/3 of the group did in fact like it the other third really did not like it. Where most of us found fruit they found chemical notes of plastic and paint-thinner. A couple of members pointed out that there is some crossover between those notes, and so it is possible that the same notes triggered slightly different receptors and associations. There are also some wine finished Tyrconnell’s on the market. As these are much more expensive than this entry-level NAS bottling I am not sure if I am likely to take a flyer on any of them if I can’t taste a sample first. Nose: Acidic; mildly fruity–melon, peach/nectarine, a little bit of lime, kiwi; a bit of over-ripe banana maybe. Some grassy notes too. Palate: Light, acidic fruit first, and then a big malty wave–roasted malt, with strong notes of chicory that present a reasonable facsimile of smoke. With time the fruitiness gets quite “thick” and a little tropical–mostly melon with a little hint of mango. Some honey too. Goes down very easy. Finish: Short and a little thin. The same acidic fruit as on the nose and palate, washing out to a peppery woodiness. A little more butyric on the finish than on the palate. Comments: Nothing remarkable and not a whole lot going on, but it is very pleasurable and an excellent malt for summer evenings. At its price (<$30 in most American markets) it is, in my opinion, a very good value–especially if you like fruity whisky. I would love to taste this at 46% or even 43%–the fruitiness would probably be much more intense, and with greater viscosity in the mouthfeel this would be quite excellent, I think.